Fiscal policy and aggregate demand, an example using the American Recovery and Reinvestment Act - FreeEconHelp.com, Learning Economics... Solved! Ever since his election in 2008, President Obama has been faced with a weakening economy. As a result, he enacted the American Recovery and Reinvestment Act in 2009 as a fiscal policy, hoping that a large amount of government spending would increase consumption and aggregate demand compared to what it would have been without the policy. But the effects of the stimulus package were much less than expected, leading to skepticism towards the new American Jobs Act that Obama is proposing. Y= C+I+G+NX. If “G” (government) increases, then “Y” (GDP) will also increase. In this example of the Dynamic Model, the economy is in a recession at point A, with Real GDP and Price Level below the potential along the LRAS curve. 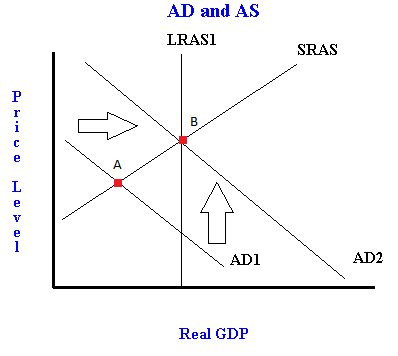 An expansionary fiscal policy will cause aggregate demand to shift to the right, from AD 1 to AD 2, increasing Real GDP and Price Level so that the economy is in equilibrium at point B on the LRAS curve. Despite what the Dynamic Model shows, some economists were skeptical of the stimulus package’s effects: The skeptics argued that because the stimulus package was developed in a very short period of time, some of the projects being funded were not well designed, and the spending on them would be wasted. For example, some of the stimulus went to transportation and housing, which included spending on construction projects like highway repair and expansion. Unfortunately, those jobs were temporary. Those who were hired for construction were once again out of a job once the projects were completed. The overestimated effects of the 2009 stimulus package have caused major skepticism towards Obama’s latest plan, the American Jobs Act. Critics say this is simply a second version of the 2009 stimulus and will do nothing for the economy, pointing out that the last stimulus promised that unemployment would fall below 8.2%. According to the Google Public Data Explorer, unemployment is now at 9.1%, which is above the promised rate after the 2009 stimulus. Additional reasons for the possible failure of the American Jobs Act can be explained by Ricardian Equivalence, an economic theory suggesting that when the government attempts to stimulate demand through debt-financed government spending, demand stays the same. This could be caused by consumers anticipating a future tax increase in order to pay off public debt, causing them to save their excess money. Another possible outcome is that the economy will take a longer time than expected to recover, if consumer confidence does not change. Right now, people believe that the economy is still deep in a recession and they do not feel that spending is safe.